Many 135 yd and 50 yd spools are on sale while supplies last, so look for the Special SALE! tags. > Micro: Look for larger spools on sale. We want to make way for the newer smaller spools! > Fine Weight - Tex 135: Same as above with sales prices all around. 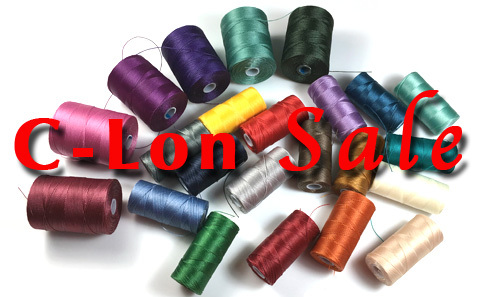 > C-Lon Bead Cord (0.5 mm) - Tex 210: Price break for full collection. > Tex 400 - Heavyweight (0.9 mm): Price break for full collection. Sale ends when items low in stock or sold out. No backorder if items are sold out. Sale for orders placed online only! Occasionally a specific bead, a cord, yarn, ribbon or something else used in a kit is no longer available. Then the kit needs to be shelved or iit needs to be remade with new material available. 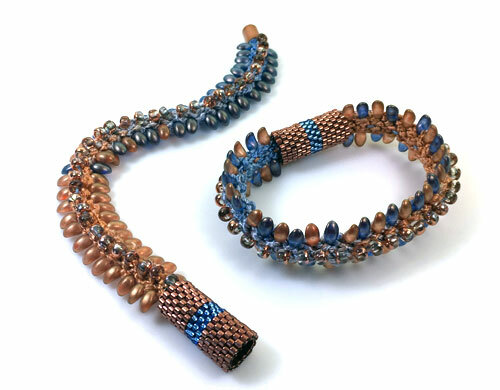 Check this new version - with Halo Blue and Tangerine Lily Petal Beads, plus Czech Copper Crystal 6/0s. 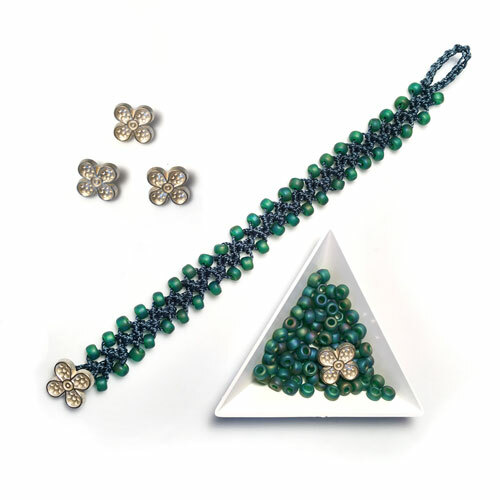 The design includes two designs, one with alternatinf Lily Petal Beads, the other one with a transition from one beas to the next The latter version is shown here on the left. January 28 - For Valentine Heart Buttons - They are all on one page now! Heart Buttons just in time for Valentine Day. 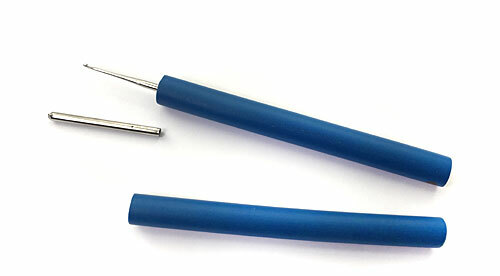 Turn the Lacis crochet hooks handles into comfortable cushioned handles. I really like the Lacis crochet hooks because you can use a smaller hook than other brands for the same cord size. The actual hook ends have small heads and large indentations for the cord to slide through. 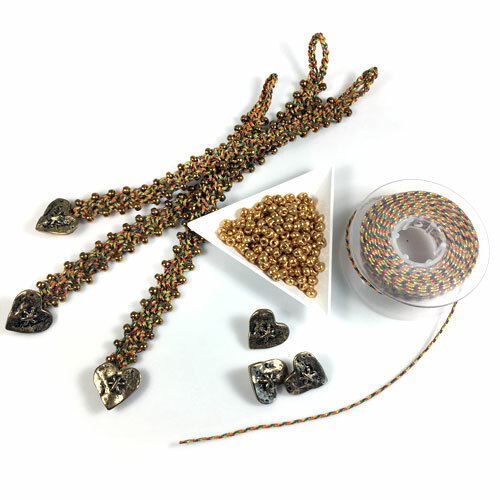 This profile, thin head but hook that can handle larger cords without snagging them makes this crochet brand my favorite for tubular bead crochet and bead crochet. But the handles are very thin and really need cushioning. Living Coral is definitively bright, lively, vibrant yet mellow at the same time. And yes it matches C-Lon Chinese Coral. To lighten it up, add a bit of Pink Lemonade (PL) to the mix. Darken it and make it unforgettable with Poinsetta. Add a bit of Sea Shell or Peach Glow for the bright edges and you capture the coral and clown fish perfectly. Look for Chinese Coral, Pink Coral, or Poinsetta, and Sea Shell. Look for Chinese Coral, Guava or Light Guava, Pink or Light Coral. Size E and New E is great for tassels. Look for Chinese Coral, Guava or Light Guava, Pink or Light Coral. Look for Coral. 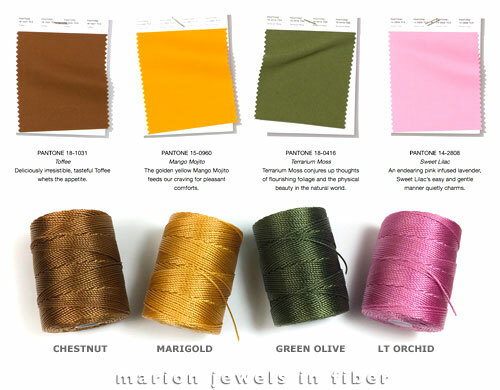 This silk comes in two sizes and i has a matt finish. Shanghai Red - Fiesta is a bright festive color radiating energy. Red - Jester Red is a deeper rich classic color. Popsicle Orange - Turmeric brings life and joy. 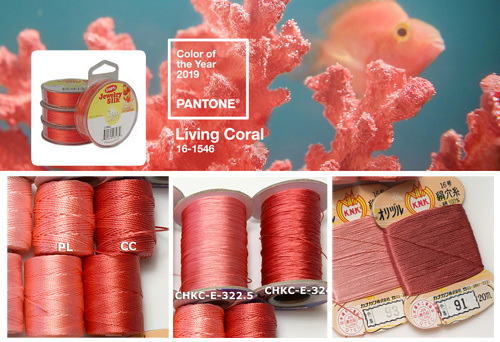 Chinese Coral - Living Coral is the Pantone Color of the year. It is vibrant and full of life with a golden undertone. Olivine - Pepper Stem is a modern color that connect us with nature. Golden Yellow - Aspen Gold brings joy, good cheer, and brighten our day. Lemon - Lemon Verbena is the London alternative color. Princess Blue - Capri a royal blue hue. Chestnut - Toffee is deliciously irresistible. Green Olive - Terrarium Moss reminds us of rich foliage and the beauty of the natural world. Light Orchid - Sweet Lilac a charming and endearing pink. Rose - Pressed Rose is the London alternative color. 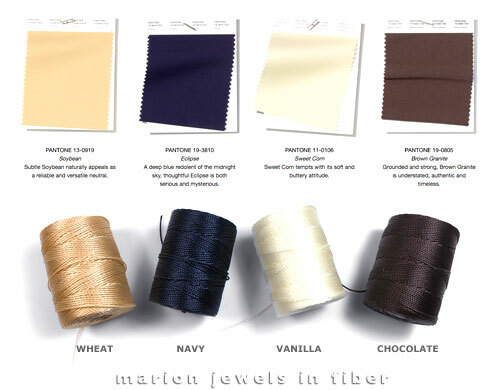 Wheat - Soybean is a natural, versatile neutral that changes depending on the colors that surrounds it. Navy - Eclipse is a deep blue like midnight, serious and mysterious. Vanilla - Sweet Corn is buttery, soft and classic. Chocolate - Brown Granite is versatile, grounded, strong, understated and timeless. It mutates depending on the colors that surrounds it. Sign up for Newsletters.. . Get the latest news, tips and technical advice via Mad Mimi delivery system with safe unsubscribe. Read past newsletters online: April 2018 | May 2018 > Sign up to receive future newsletters! 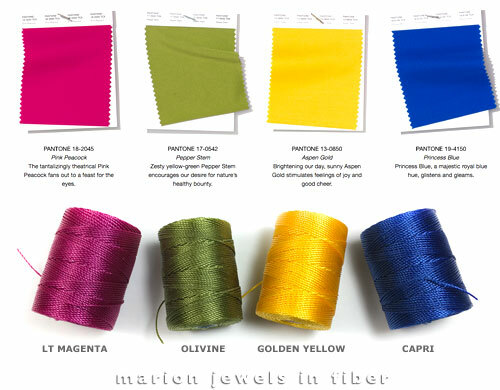 Visit Marion Jewels in Fiber on Facebook... and interact! 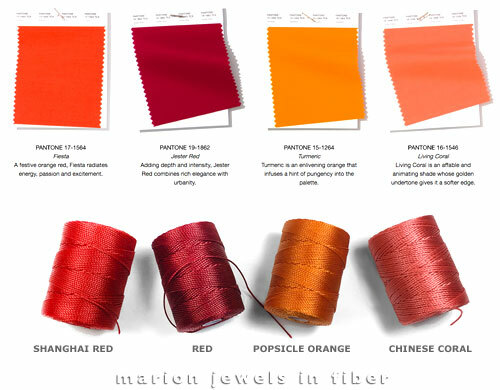 Comparing C-Lon Colors with KNK/FJX Silks and Chinese Knotting Cord Size E - Large pictures to help choose colors, plus a PDF document listing all C-Lon colors and their closest match in silk and Chinese Knotting Cord. Barefoot Sandals DIY Tutorial - A perfect summer project! Square Needles, Gimmick or Innovation? 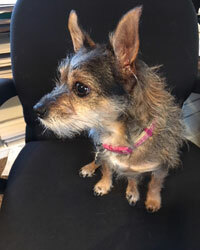 We now have an official store mascot! Occasionally she sheds a few hair even though she is small and does not have lots of hair. So please forgive her if you find a few in your package. Packing tape on boxes wrapped on the floor are most affected even though we vacuum often.